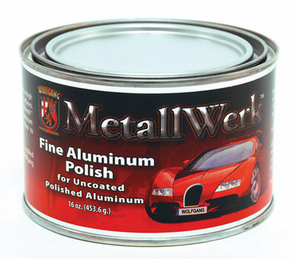 Wolfgang MetallWerk™ Fine Aluminum Polish works like magic on aluminum and chrome wheels. It erases oxidation and brake dust damage with its combination of cleaners and abrasives. Yellowed areas where brake dust has glazed the metal will disappear. The fine abrasives will eliminate the tiny pits where brake dust has begun eating into the metal. Meanwhile, Wolfgang MetallWerk™ Fine Aluminum Polish lifts stubborn brake dust and road grime off the metal. This is the grime that’s left on the wheels even after you’ve cleaned them. This polish cleans it all! Before (left) and After (right) results from using Wolfgang MetallWerk™ Aluminum Polish. If you are not sure whether the surface in question needs a prepolish, test a small area by polishing with Wolfgang MetallWerk™ Fine Aluminum Polish. If it gives you the desired results, there is no need for compounding. If you still see some oxidation and hazy areas, use the Wolfgang MetallWerk™ Aluminum Compound and then use Fine Aluminum Polish. For wheels, you can also use the Mothers PowerBall Mini to reach between spokes. Wash used pads and towels in a mixture of McKee's 37 Polishing Pad Rejuvenator and water. Allow them to soak for several minutes and then rinse. Air dry or machine dry on low.